Houston is running away with the AL West, but its chances in October could be severely impacted if it doesn't find a way to get a reinforcement for its rotation. The Astros own the American League's best record at 74-47 and hold a commanding 12-game lead in the AL West, but lately, they've been in a funk, and members of the team have openly complained that general manager Jeff Luhnow didn't do enough to bolster the roster for the postseason before the non-waiver trade dealine on July 31. With the Aug. 31 waiver deadline still nearly two weeks today, it's not too late for the team to make moves—and they should, because suddenly they look quite vulnerable. Through the first two months of the season, the Astros were firing on all cylinders, but in June, the cracks became apparent, in part because 2015 AL Cy Young winner Dallas Keuchel, who had recovered his ace form after a rough 2016 season, landed on the disabled list due to a pinched nerve in his neck following his June 2 start (he had missed one start in late May with the same problem). He didn't start again until July 28, and in his absence the rotation wobbled. While Mike Fiers and Brad Peacock both posted sub-3.00 ERAs in June and July, Lance McCullers Jr., who carried a 2.69 ERA through the end of June, was cuffed for 20 runs in 18 1/3 innings over four July starts before going to the DL himself due to back discomfort; he has yet to return to action (more on which below). As for the rest of their starters, Charlie Morton was solid after returning from a six-week absence due to a lat strain, Collin McHugh a bit shakier after coming back from a season-long absence due to elbow impingement and youngsters Joe Musgrove, David Paulino and Francis Martes were knocked around for ERAs above 5.50 during their trials. In the days leading up to the July 31 deadline, the Astros reportedly made only limited pursuits of the top starters who were moved, namely Jose Quintana (who went from the White Sox to the Cubs), Sonny Gray (A's to Yankees) and Yu Darvish (Rangers to Dodgers). According to FanRag Sports' Jon Heyman, "[O]ne rival exec says it was his understanding the Astros made six prospects off-limits." Via MLB Network's Ken Rosenthal, Luhnow’s focus was on the bullpen at the deadline, and the Astros went into July 31 believing that they would wrap up deals for three relievers, the Blue Jays' Francisco Liriano (struggling as a starter), the Orioles Zach Britton and "a third, unidentified high-end type whose addition would have surprised the industry, according to major-league sources." Only the Liriano deal was completed. As Rosenthal wrote on Facebook, "The mystery reliever stayed put when his team’s owner decided against trading him, while the Britton talks broke down—as negotiations with the Orioles sometimes do—when the O’s raised concerns about the medical condition of at least one player coming back to them." Ouch. Since then, Liriano has been shaky, but the bullpen, which added Tyler Clippard in a trade from the White Sox last weekend, has rediscovered its form. The rotation? Not so much. Morton has posted a 3.32 ERA in three starts, two of them quality starts, but McHugh, Peacock, Keuchel and Fiers have combined for a 6.56 ERA with just three quality starts out of 13. 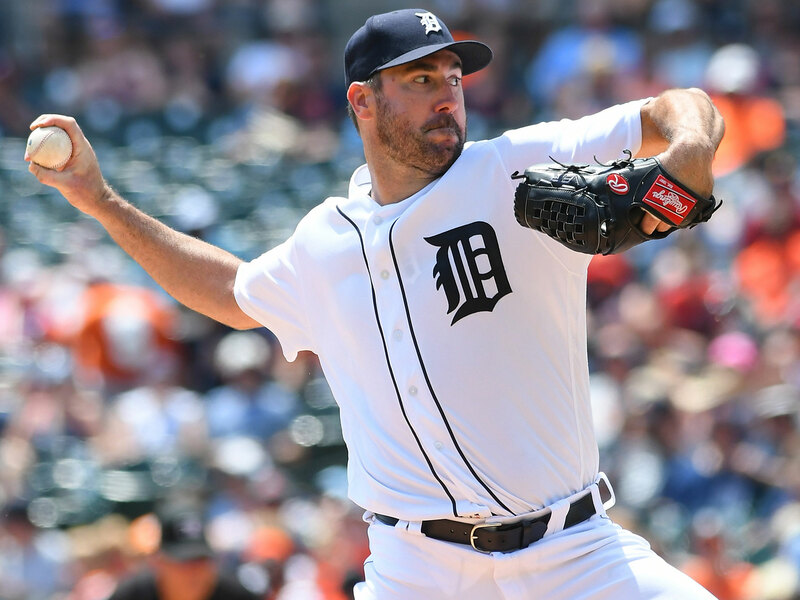 Prior to the deadline and again this month, the Astros engaged in talks with the Tigers about righthander Justin Verlander, who has cleared waivers, but the two teams have apparently reached an impasse. As Heyman reported, "One person involved in the talks said it was his impression the talks were 'put to bed last week.' "
Detroit, which is in the midst of a rebuild, could certainly stand to unload the 34-year-old Verlander. Even with a 2.72 ERA since the All-Star break, his 4.11 overall mark is his highest since 2014; his 1.2 home runs per nine is a career worst, while his 3.8 walks per nine is his worst since '08. That's an ominous trend for a pitcher who is owed roughly $7 million for the remainder of this year and then $56 million in 2018 and '19, with a $22 million vesting option for 2020 (contingent upon finishing among the top five in the 2019 Cy Young vote). Add to that his no-trade protection as a 5-and-10 player (10 years of major league service time and at least five with his current team) and it's not hard to see how any potential deal for him could run aground. If not Verlander, though, Houston should still be in the market for rotation help, because neither of its top two starters is in working order. Keuchel has managed a 7.23 ERA in four starts since returning from the DL, only the last of which was a quality start. McCullers doesn't appear likely to return before September; after Thursday's bullpen session, according to the Houston Chronicle's Hunter Atkins, McCullers said he would talk to the media in "a couple days, when [manager] A.J. [Hinch] and them determine what's the next step." As to whom the Astros could acquire, it's not as though there are frontline pitchers easily available. The best bet would be a capable innings-eater who might go on a roll, like the Giants' Jeff Samardzija, the Padres' Jhoulys Chacin and the Braves' R.A. Dickey. Samardzija, whom the Astros explored dealing for prior to the deadline, still has more than $40 million remaining on his contract through 2020, not to mention limited no-trade protection (the Astros are not on his eight-team pre-approved list); he reportedly has yet to be placed on waivers. As of Tuesday, the Blue Jays' Marco Estrada, another pitcher often mentioned in such a context, had been claimed on waivers by an unidentified team, and with more than 48 hours since then, it's safe to presume he's been pulled back and is staying put. Other options, such as the Twins' Ervin Santana and the Rangers' Andrew Cashner, are complicated by pitching for teams that still hold an outside shot at a wild AL wild card race in which nine teams are within three games of a spot. The next week and a half should winnow the field, and in the interim, the Astros should gain more clarity about the conditions of Keuchel and McCullers. But if things haven't straightened out and Houston gets to September without further reinforcement, it won't be a surprise if the team that once appeared to be rocketing towards this year's World Series is knocked out of orbit.